Visible satellite imagery shows that Chantal is moving quickly westward and has organized into a tropical storm overnight. Fast moving tropical cyclones in the deep tropics have difficultly in strengthening. 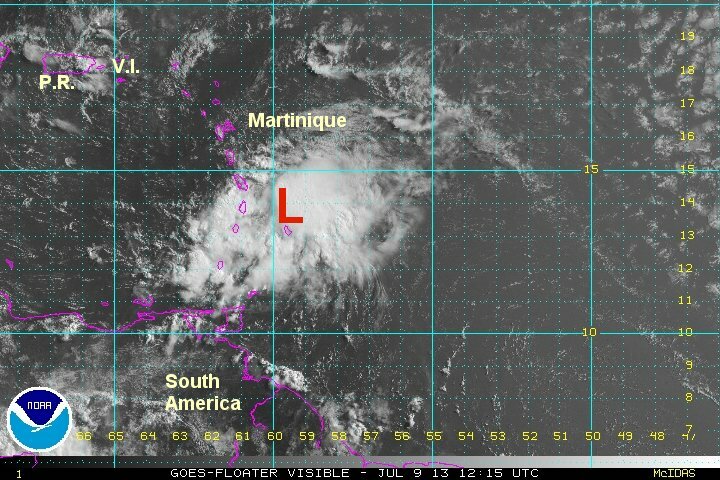 Chantal will be affecting the Lesser Antilles by late tonight. The main concern will be for heavy rainfall of 2-5" as Chantal passes. Some winds may be over 50 mph which could cause spotty power outages. As of 5 am ast (edt) Chantal was centered at 10.4 N / 49.5 W or about 705 ese of Barbados. It was moving west at 26 mph. Top sustained winds estimated at 40 mph (40 mph NHC advisory). Pressure was estimated at 1007 mb. Forecast models take Chantal toward the northern Caribbean. It should be in the vicinity of the Lesser Antilles by late tonight into early Tuesday. 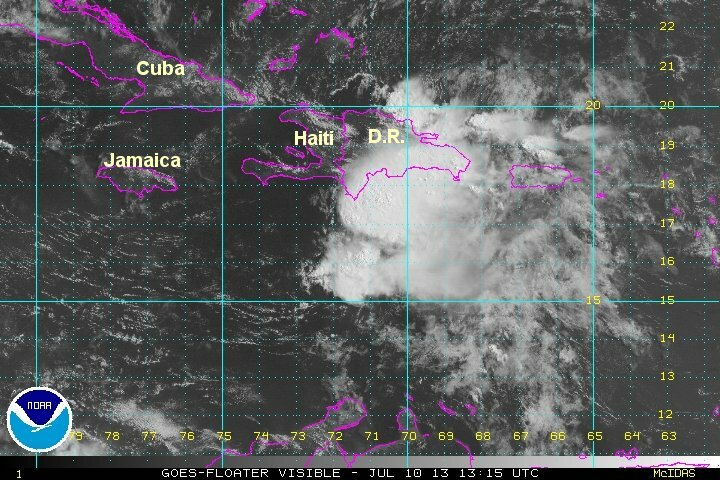 Chantal is expected to move near Hispaniola by Wednesday. If this happens, the circulation will be greatly disrupted. By Thursday, moisture from Chantal will be near south Florida and the Bahamas. Chantal is moving very quickly westward. Models do not strengthen Chantal to hurricane strength at this time. Fast moving systems in the deep tropics have difficulty in strengthening. This should be monitored closely! 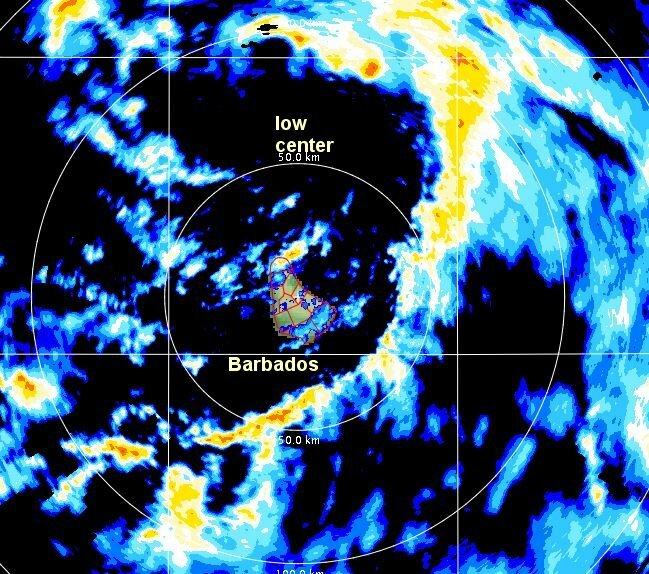 Chantal has been battling nw wind shear today with the deep convection on the se side of the circulation. Satellite shows an attempt at some reorganization late this afternoon. 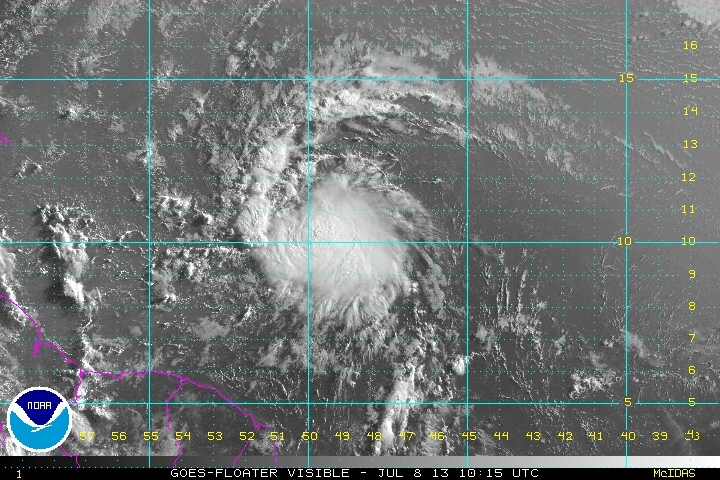 A recon reached Chantal after the advisory was posted. Winds appear to be a bit higher from a recent recon. Reports from Barbados and other Islands have been in the 20-30 mph range. Expect winds to increase as the stronger side of the storm passes during the next several hours. The pressure is still very high for a tropical storm! As of 8 am ast (edt) Chantal was centered at 13.8 N / 59.7 W or about 45 miles nnw of Barbados. It was moving wnw at 26 mph. Top sustained winds estimated at 60 mph (50 mph NHC 8 am advisory). Pressure was estimated at 1010 mb. Forecast models take Chantal toward the northern Caribbean and is expected to move near Hispaniola by Wednesday. If this happens, the circulation will be greatly disrupted. By Thursday, moisture from Chantal will be near south Florida and the Bahamas. Chantal is moving very quickly to the west. Tropical cyclones have a very difficult time holding their circulation together at speeds like Chantal is displaying. 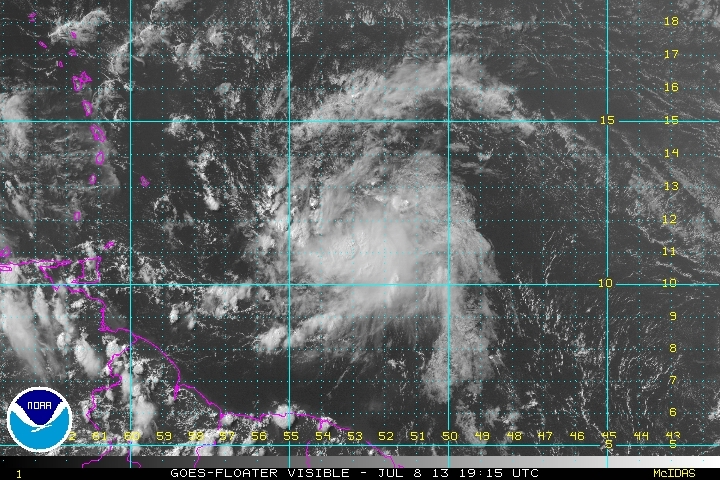 As NHC stated Chantal may be a tropical wave and an air force hurricane hunter is heading to investigate. Regardless of the strength, heavy rainfall will move across Hispaniola of 5-10 inches. Lesser amounts will be seen across Puerto Rico into the southern Bahamas. As of 8 am ast (edt) Chantal was centered at 16.5 N / 70.8 W or about 155 miles ssw of Santo Domingo. It was moving west at 29 mph. Top sustained winds estimated at 40 mph (45 mph NHC 8 am advisory). Pressure was estimated at 1011 mb. Forecast models take Chantal across Haiti and into the Bahamas then eventually into the Southeast coast as a tropical depression several days from now. If Chantal stays weak it will move much farther west than the models indicate. Chantal was sheared apart today. Advisories ended at 5pm ast / edt.